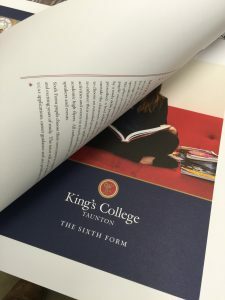 King’s College Taunton was delighted with the printing of the recent update to its latest Sixth Form College brochure as we used our unique lightcure technology to turn around the job in less than 24 hours, leaving no messy print marks on the uncoated paper. Our unique lightcure technology means that rather than waiting for drying, the printed sheets are ready immediately to be turned and printed on the reverse or trimmed and folded. Customers requiring a very fast turnaround on premium quality litho print can benefit from this leading edge technology. King’s College is a co-educational day and boarding school for pupils aged 13–18 years. It is based on the edge of Taunton in an 80 acre site.